The Tokyo Art Foundation held a Christmas charity dinner, featuring a concert and professional wrestling at a Tokyo hotel on Dec. 9. All proceeds from the event, “X’mas Charity Pro Wrestling Dinner Show,” held at Hotel Chinzanso Tokyo, will be donated to the Lesotho-based charity Sentebale, which promotes efforts to eradicate AIDS. 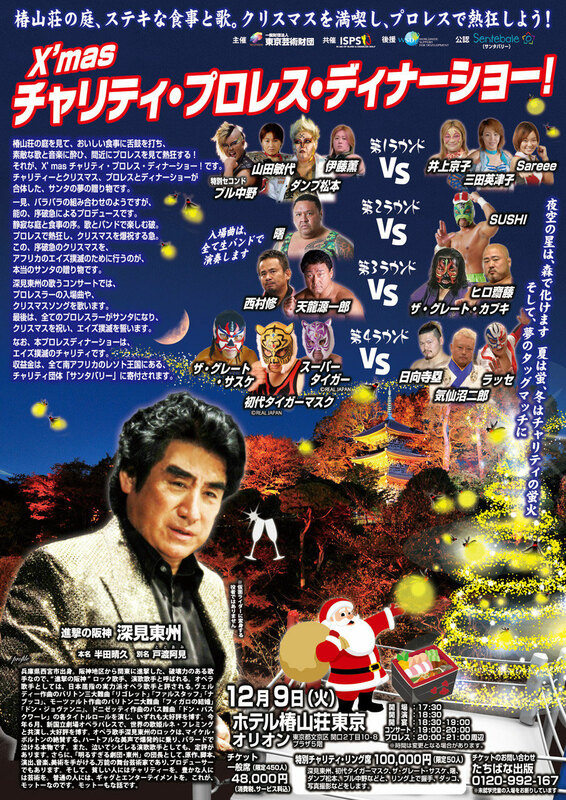 “Christmas, a concert, pro wrestling and dinner; I’ve never seen such a combination,” TAF Chairman Haruhisa Handa said to 520 guests, who enjoyed Handa’s concert and battles between 18 pro wrestlers over dinner. During the concert, Handa, who also goes by Toshu Fukami, sang 14 songs, mainly Christmas songs, including three he wrote himself. He began the concert with his three originals, “Kimi no Inai Merry Christmas” (Christmas without you), “Anata no Iru Merry Christmas” (Christmas with you) and “Christmas Keikaku” (Christmas plan). While singing Jingle Bells, he changed the lyrics to insert the names of shrines ending with the word “Jingu” such as Ise Jingu, Atsuta Jingu and Meiji Jingu. Following the concert, the action heated up as the 18 pro wrestlers prepared to face each other in the squared circle that was the centerpiece of the hotel ballroom. In the first fight, a team of Toshiyo Yamada, Dump Matsumoto and Kaoru Itoh fought the team of Kyoko Inoue, Etsuko Mita and Sareee. The match ended with the young and petite Sareee pinning the veteran Matsumoto. In the second match, former yokozuna sumo champion Akebono overpowered wrestler Sushi with multiple diving body presses. The third bout was a tag-team affair that saw The Great Kabuki and Hiro Saito square off against Genichiro Tenryu and Osamu Nishimura. Saito ended the fight by pinning Nishimura after The Great Kabuki staggered Nishimura with multiple uppercuts. To finish off the evening, The Great Sasuke teamed with Tiger Mask I and Super Tiger to take on Rui Hiugaji, Jiro Kesennuma and Rasse. As the wrestlers made their entrance, Handa sang the theme song from the popular Tiger Mask anime. The match ended with Tiger Mask I holding Hiugaji upside down and driving his head into the mat, a move known as the “tombstone piledriver,” before pinning him. After the matches, the wrestlers visited guest tables with a bag of Christmas goodies, handing each guest a small bag of snacks. The dinner show was hosted by TAF, co-organized by the Worldwide Support for Development (WSD) with support from the International Sports Promotion Society (ISPS). Handa is the chairman of both the WSD and the ISPS. The proceeds from the gate will be spent on various Sentebale programs. Sentebale was founded in 2006 in Lesotho, a country in Southern Africa that has only 1.8 million people, but has the world’s third highest percentage of HIV carriers. In the impoverished nation, a third of the children are orphans and the average life expectancy is only 48 years. Handa is involved in various charity events through WSD, a nonprofit organization that is committed to assisting disadvantaged people and communities throughout the world. The Tokyo Art Foundation was founded in February 2011 to promote various forms of music and other entertainment. It holds rock, enka, opera and other types of concerts as well as plays across Japan. Recently, TAF staged an enka concert, “Hanshin Storm Enka Concert,” featuring Handa and enka star Akira Kobayashi on Nov. 14, as well as an opera concert, “Blazing Autumn People’s Concert,” on Oct. 6 with Hiroko Onuki, a Japanese soprano, and John Longmuir, a Scottish tenor. On Sept. 26, TAF held a rock concert, “Shingekino Hanshin Kyojin Rock Concert,” with former Toto frontman Bobby Kimball, Starship vocalist Mickey Thomas, former Journey singer Steve Augeri and former Deep Purple vocalist Joe Lynn Turner at Nippon Budokan in Tokyo.